Constructed from a natural rubber latex shell that has been double-dipped in neoprene for enhanced resistance, the Ansell Bi-Colour 87-900 Heavy-Weight Chemical-Resistant Gauntlet Gloves provide reliable protection against a range of chemicals, including salts and detergents, as well as micro-organisms and radioactive contamination. 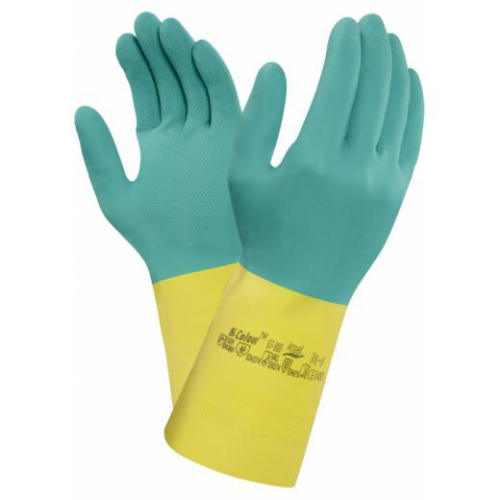 These features, combined with a textured surface that promotes good grip in both wet and dry conditions, make the Bi-Colour 87-900 Gloves ideal for a variety of cleaning and manufacturing applications. These gloves are available in a range of sizes. To determine which size is best for you, please measure the circumference of your hand around the knuckles (excluding the thumb) with your hand open and your fingers together, and the length of your hand from the tip of your middle finger to your wrist.